It’s the most wonderful time of the year. No, not Christmas, Hop Selection Season! The location: Washington state’s beautiful Yakima Valley. 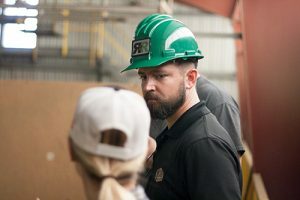 We sent Brewhouse Manager Karl Schmitz and Lead Brewer Mike “The Golden One” Gold on their second-annual trip to hand-select the hops we use in Third Street Brewhouse beers. Last year was educational. This year, Karl and Mike arrived with a strategy and a better idea of what to look for this year. The number one priority: consistency. It is essential to keep pace with the precedent we’ve set for the Third Street Brewhouse brand – so this year’s hop selection had to be on-point. 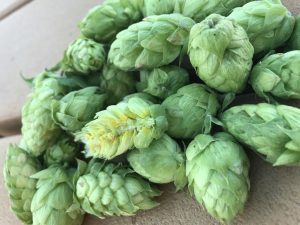 The bulk of the hops we use in our beers throughout the year are purchased from Yakima Valley suppliers like Hopsteiner and John I. Haas, Inc. That’s why we sent Karl and Mike out to visit the suppliers and make their selections. Once the decisions are made, we can purchase the hops we want throughout the year as needed. The actual hop selection ensures we can continue to make the same beers consistently and accurately. It gives us the opportunity to match a new year’s crop with what we used last year. That way, our beers keep a consistent flavor between batches. The Hop Lift you had last fall will taste like the one you have in your fridge right now. This year, Karl and Mike selected Ekuanot, Glacier, Mosaic, Denali and Bravo hops. For more on the selection process, check out our blog post: Choosing the Perfect Hops. Hops are grown and harvested once each year. Growers plant the hops each spring when the soil is still cool. As they grow, they’re strung onto wires to encourage vertical growth. 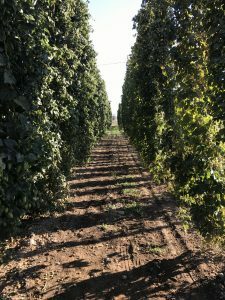 Hops need consistent watering, but not too much. It is essential to let the ground dry fully between watering. This prevents mildew from forming. Nobody wants to drink mildew. Around the summer solstice, as the nights begin to get longer, the cone-shaped burrs begin to form. The hops will continue to bloom and ripen well into August. For many hop varieties, harvest begins in September. Some early crops may be ready in mid-August, and late crops are ready by late-September. The harvest, in general, lasts about six weeks in the Yakima Valley. After the burrs have been harvested, they are baked in a kiln, low and slow over 8-12 hours, until they are nice and dry. 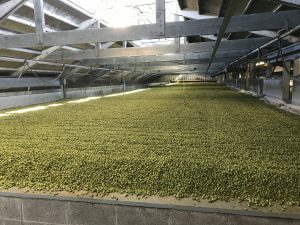 The baked hops are then allowed to cool before being shipped to suppliers for processing. Suppliers often process the hops into pellets, which are then frozen. Brewers can purchase the frozen, pelletized hops year-round to create the delicious, aromatic brews we know and love. A lot of the experience in Yakima is learning about new varieties of hops. 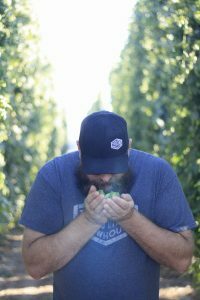 Karl discovered Denali hops last year, which was the first year it was produced commercially. 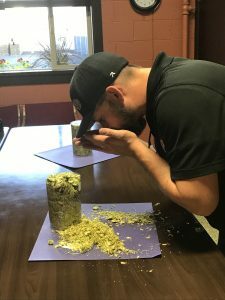 He got to taste some beers brewed with Denali hops, and brought home samples from suppliers. The crew at Third Street Brewhouse liked Denali and knew we wanted to use it somehow. When we were formulating Sanity Break, we knew Denali hops would be an excellent complement to the Mosaic hops we were already planning to use. The blend turned out incredibly well. Sanity Break is an incredibly balanced session IPA that is full of hoppy flavor without the high ABV. Now that Denali hops are commercially available, Karl and Mike got to select the hops. They chose the specific lot that best matched Sanity Break this year. 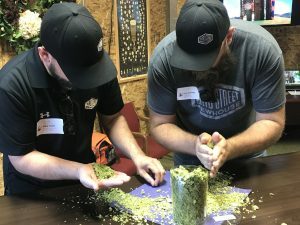 Karl and Mike got a sneak peek of a few experimental hops. These hops don’t even have names yet. One variety had a lemon-pear aroma that immediately got Karl thinking of a hefeweisen or a pilsner. They brought some samples back and can hardly wait to have our brewers get their hands on it. There’s definitely some inspiration to be had with this one, and we’re excited to sample the results. We’ve certainly got our work cut out for us in the coming year. We’ve got beer to brew and opportunities to experiment with new hops. Until next year, Yakima.